For patients who are experiencing impaired vision because of sagging eyelids, eyelid surgery, also known as Blepharoplasty, improves the appearance of your eye area by removing fatty deposits and excess skin. 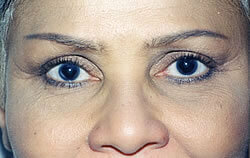 This procedure can be performed on both the upper and lower eyelids. Most patients may have eyelids that are obstructing their vision and after Blepharoplasty, they are thrilled with their vision because it can open up their visual field. This surgery can also enhance a more youthful appearance. 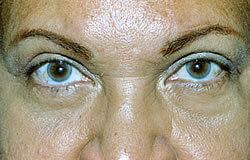 When it comes to cosmetic eyelid rejuvenation you want a specialist. Randy Burks, MD, FACS is a fellowship trained Eye Plastic and Reconstructive Specialist with over 30 years of experience in helping patients achieve the best results in aesthetic eyelid rejuvenation. If skin changes, facial aging, and sun damage have made you uncomfortable with your appearance, an eyelid rejuvenation procedure can help you look and feel great again. An eyelid lift, called a blepharoplasty, can dramatically improve a tired or aging appearance by removing the excess skin and fatty tissue that causes droopy, baggy, eyelids. It is one of the most common cosmetic procedures performed in the United States and the photos below represent the results that may be achieved. 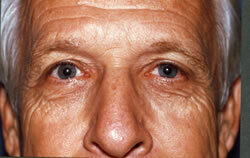 Dr. Burks specializes in repairing and improving the appearance of the eyelids. Procedures are performed in our office surgical suite which is dedicated to laser and eyelid cosmetic and reconstructive surgery. If skin texture issues are adding to the tired aging appearance of your eyelids, Laser skin resurfacing is often also recommended to enhance skin tone and texture and to give a more youthful appearance. 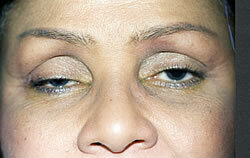 For most patients, the recovery time is brief and bruising is minimal. Laser skin resurfacing adds to your recovery time but the results are worth it. Dr. Burks will evaluate you at the time of your consultation and determine the most appropriate and effective treatment method for your problem. He will discuss techniques, anesthesia, recovery time and costs as well. 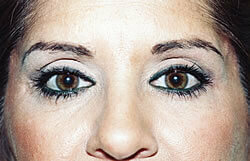 Some insurance companies and Medicare will cover eyelid lifts if certain medically indicated criteria are met. Be sure to ask Dr. Burks if part of your procedure can be covered by your medical insurance. 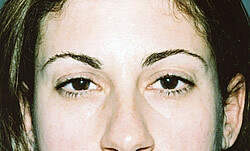 Often, patients present seeking an eyelid lift only to discover that their drooping brows are part of the problem. 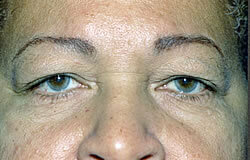 It is easy to confuse the conditions because a sagging brow can cause or contribute to droopy eyelids. 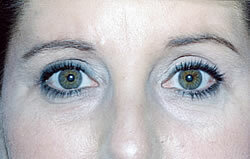 Sometimes a brow lift is combined with an eyelid lift to fully correct the symptoms. Treatment must be directed to address the problems that exist in a given patient and the selected procedure must be tailored accordingly. If a drooping brow is contributing to a tired baggy eye look, it can be fixed at the same time as the removal of excess eyelid skin. Dr. Burks utilizes new techniques that makes the procedure less invasive, no longer requiring large incisions,hair removal, or visible scaring. 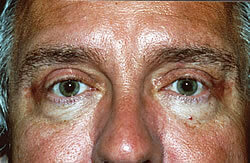 This new technique gives patients lasting results and compliments the removal of excess eyelid skin. It can be coupled with laser skin resurfacing to help achieve the best skin texture and cosmetic result possible. 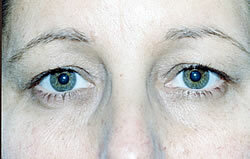 The photos illustrate the bright, energized look that can be achieved with brow lifting at the time of eyelift surgery. 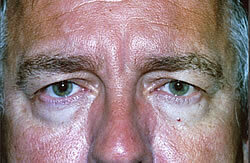 Sometimes the cause of a droopy eyelid is not baggy skin and fat, it is a weak muscle in the eyelid. 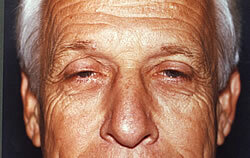 The weak muscle won’t lift the eyelid up far enough so the lid may look half closed. The muscle weakness can be congenital or acquired later in life due to trauma or nerve damage or from long term use of contact lenses. Occasionally, the lid can droop far enough to affect the vision. In addition to the loss of central and peripheral vision, the psychological effects of having a cosmetically displeasing problem can have an impact on your self image. 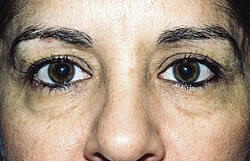 Ptosis can usually be corrected with a surgical procedure in our office surgical suite. There is little discomfort and recovery is quick. In addition, the procedure is often covered by Medicare and most insurance companies.